The concert on 19 May 2012 was a little different from the NYC's usual pattern! It featured favourite choruses and arias from a range of grand operas. The audience was seated informally at tables, in candlelight, with access to a bar for drinks and nibbles. This page brings together some accounts of the evening. 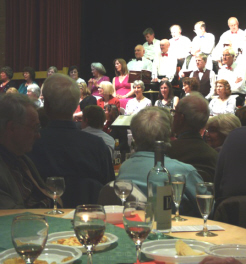 Regular followers of North Yorkshire Chorus will remember their last concert at St Mary’s Church in Thirsk, where an evening of sacred music by Rossini, Haydn and Puccini made up the programme. Their latest concert, at the Hambleton Forum in Northallerton, was a different event altogether. It featured rousing favourites from the operatic repertoire, performed to a sell-out audience seated round cabaret tables in an informal atmosphere. One was struck by the age-range of the audience, and the number of children and young people who obviously enjoyed the colourful and varied programme. For some of them it will have been their first taste of a concert like this: from the chatter and smiles at the end of the show, it may well be that they will come back for more. A choir of over sixty singers was augmented by soloists Anna Belward (soprano) and Paul Smith (Tenor), sensitively accompanied by Andrew Christer at the piano and, in the final item, Verdi’s Triumphal Scene from Aida, by the stirring trumpet playing of Colin Pearson. Mention should be made of 11 year-old Benjamin Smith, who played a finely-tuned anvil (kindly loaned by Thirlby blacksmith Jim Sheldrake for the occasion) in the Anvil Chorus from Verdi’s Il Trovatore. All of this was under the precise and energetic direction of their regular conductor, Greg Smith. The programme was varied and lively. It included the haunting soprano aria 'Song To The Moon' from Dvorak’s Rusalka and the teasing of 'Adele’s Laughing Song' from Die Fledermaus, both of which pieces allowed Anna Belward to show an astonishing range of vocal pitch and colour. 'Poor Wandering One' from The Pirates Of Penzance became a charming parlour duet, while Paul Smith was able to let loose with a rousing 'Nessun Dorma'. By contrast, the whole choir gave splendid force to the grand chorus pieces in the programme, ending in fine form with the last item, from Aida. Proof – not that proof is needed – of the range of this ensemble will be their next concert, a joint performance with Wetherby Choral Society of Edward Elgar’s Dream Of Gerontius, at Ripon Cathedral on Saturday 17th November 2012. Congratulations to the NYC on a very successful performance of Operatic Favourites on Saturday 19 May 2012. The setting for the audience was both amenable and sociable, and a very conducive arrangement of seating to enable the audience to both see and hear the choir to full advantage. The choir’s singing was excellent and they obviously enjoyed the material they presented. We only wish that the programme had featured more of the choir. The soloists were both humorous and informative in their introduction to their pieces, which were very well executed. It was altogether a thoroughly enjoyable first experience of an evening of choral singing by the North Yorkshire Chorus. The choir made a confident start with chorus from Verdi’s La Traviata. The piece included the soloists who sang with bravura, and set the scene for an enjoyable evening. The second piece, Dido’s Lament from Purcell’s Dido and Aeneas, was beautifully sung by the soprano soloist, Anna Belward. The solo arias which followed included several well known pieces. Paul Smith, the tenor soloist, sang ‘La donna e mobile’ from Rigoletto with great flair and the timbre of a true operatic tenor. In the second half the solo arias included Puccini’s ‘Nessun Dorma’ . This piece has become such a favourite in recent years that we have become very conditioned to certain recorded performances. Paul Smith sang it with confidence and hearing a live performance was a pleasure, but in the final climax there was some oversinging, even though he has a big voice which can carry the piece. Another highlight was Anna Belward’s performance of Adele’s Laughing Song from Die Fledermaus, sung with panache and obvious enjoyment. It would be tedious to mention every one of the 20 items which made up the programme. There was great variety, ranging from Purcell and Mozart to Gilbert and Sullivan. Overall both soloists were excellent, and the enthusiasm and enjoyment of the chorus came across to the audience. Mention must be made of the immense contribution to the evening made by the accompanist, Andrew Christer, who played very sympathetically. And of course the Conductor, Greg Smith, worked tirelessly to bring the best out of his singers. The concert finished with a stirring performance of the Triumphal Scene from Verdi’s Aida. The addition of Colin Pearson’s solo trumpet provided great brilliance and led to calls from the audience for an encore. Clearly everyone had thoroughly enjoyed the evening.